“One of a Kind” puzzles are always desirable!! The V-SPHERE™ is an innovative, certified product with high quality EU standards of manufacturing. This novelty is one of the successful series of Brain Teasers manufactured by V-CUBE . The company’s “know how”, work passion and an excellent international network of collaborators warranties to the players easy access to a unique product. The V-SPHERE™ has been inspired and developed in EU- Greece. This is an innovative, certified product with high quality standards of manufacturing. But the greatest success factor of all remains the focused work of Verdes Innovation Team with the passion to offer the best to its customers. The product can be played from boys and girls of all ages. Its friendly functionality and smart design is striking. The V-Sphere’s innovative design will charm you; its quality will impress you the challenge of playing will amaze you!! This unique spherical sliding puzzle offers to the player a superb mental experience, gradual puzzle completion and addictive fun! It is a light, but sturdy puzzle with permanent vibrant colors and the smoothest sliding play you can ever imaging! 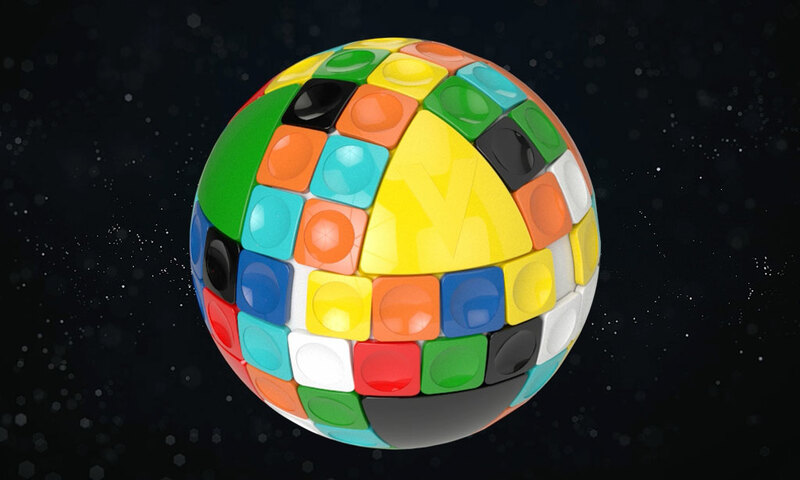 The V-SPHERE™ is a worldwide PATENTED sliding spherical puzzle. The V-SPHERE was inspired and manufactured in EU- Greece. This product is a worldwide PATENTED sliding spherical puzzle. The sophisticated puzzle concept combined with the highest European manufacturing quality, warranties the ultimate user satisfaction. The prestigious UK TOY SHOP AWARDS enjoy unrivalled respect within the toy industry, thanks to being voted for - not by "experts", "testers" or "panels" - but by the best UK independent retailers! A sticking product deserves a sticking package! The premium statue package complements graciously the V-Sphere with its innovative design which has been AWARDED!! This excellent package offers a 360 degree visibility of all product sides. At the same time offers effective product protection for safe transport around the globe. The inventor of the V-Sphere is the engineer Mr. George Xronopoulos. This is an ingénues Greek man enjoying making functional and innovative inventions. Among his inspirations was the sliding sphere which combines suburb functionality, playing satisfaction and high quality of materials. The cleVer Cube that’s changing the world of cubes! The four trilogies offered will blow you mind off! This is an extraordinary Brain Teaser offering thrilling pattern-puzzle solving experiences. Themed around the journey of the great, Greek mythology hero, Hercules, this game consists of four Collections of three Labors each. There is a progression in difficulty from one Labor to the other and from one Collection to the next. The puzzles were designed by hand and originate in the home land of Hercules. The sincere effort to offer innovative puzzles and games to the customers worldwide continues with passion and inspiration sourcing from them!" The company’s philosophy is customer oriented. The EU manufacturing quality is of the highest ISO standards. Furthermore, product innovation and continual introduction of novelties is of prime importance, in order to safeguard consumer’s satisfaction.